I have only discovered Jane’s books fairly recently. I have read two of them so far and absolutely loved both although I know that I have a fair few other books to catch up on. Book addict me says ‘yippee’, my purse just says ‘oh dear’. Anyway I digress so back to the review I go. You can imagine my excitement when I was asked if I would like to take part in the blog tour for ‘Tell Me A Secret’. After the squealing had finished, I did a little happy dance, which was thankfully only witnessed by my two Labradors. Of course I said yes and I eagerly opened the book and began to read. Well I absolutely, totally, flipping well loved ‘Tell Me A Secret’ but more about that in a bit. I couldn’t help but take to the character of Holly Cooper from the first moment I met her. She is an ambitious young woman, who has received a long overdue promotion. You would think that her friends would be happy for her but that is so not the case as regards one particular character. Appearances can be very deceptive. When things start going wrong for Holly, I couldn’t help but want to jump inside the pages of the book to give Holly a hug to reassure her and to attack her back stabbing friend by giving her a few dozen slaps across the face with a wet fish. Holly is nice, kind, gentle, compassionate, supportive and she seems to be the sort of person I could imagine having a cup of tea and a gossip with. She seems to be a huge support to her other friends and above all to her daughter, who has discovered that she is pregnant. Holly seems to spend that much time running around and looking everybody else, that her own needs seem to be way down the list of her own priorities. Holly could do the job standing on her head but somebody manipulates certain situations to case Holly in a bad light. I don’t want to type too much about who does what and when because I don’t want to give too much away. 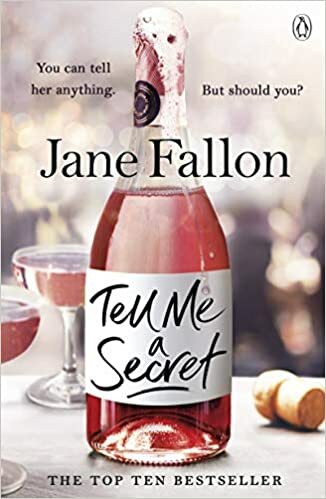 Oh my giddy aunt I was hooked on ‘Tell Me A Secret’ from the very first word on the very first page and reading the book soon became an addiction. I found it simply impossible to put the book down because I was enjoying it so much. I loved everything about the book from the author’s writing style to the storylines to the characters and beyond. I didn’t realise just how quickly I was reading this book until I happened to look at the page number I was on and realised that I had actually read over half of the book. From then on, I tried to ration how much I read in one reading burst but my attempts at rationing failed because I just had to read on and on and so on. It seemed to take me next to no time to get through the book but in reality it took me a few hours to get through the book. The time and page numbers just seemed to fly past in a blur. In my opinion ‘Tell Me A Secret’ is superbly written. The author has one of those writing styles that draws you in from the start and it feels as though you are actually part of the story yourself. That’s how I felt anyway. The author clearly cares about her characters and this shines through in her writing. She describes her characters so vividly and so realistically that it was almost as if the characters jumped off the page and came to life. I found that I genuinely cared about Holly and what happened to her. Indeed I felt as though she had become a friend and felt very protective of her. I usually have the attention span of a gnat but not in this case because my sole focus was on the book itself and I was able to shut out all other distractions. In short, I simply adored reading ‘Tell Me A Secret’ and I would definitely recommend this book and indeed this author to other readers. I find Jane’s books to be fun and light hearted and above all they are extremely addictive reading. I can’t wait to read what Jane Fallon comes up with next. I, for one, will be first in the queue to read it. In the meantime I will definitely be getting copies of all of Jane’s other books and make reading them one of my top reading priorities. The score on the Ginger Book Geek board is a very well deserved 5* out of 5*.